When innovation is your growth driver, then you generally tend to climb the ladder of success easily. The same holds true for three friends who came together to start an innovative startup called Smarterify. Sandeep has a bachelor of engineering degree in computer science and is acting as the CEO of Smarterify. Sreekanth has a degree in electronics and communication engineering and is working as CTO of Smarterify. Anil Kumar as an engineering degree in electronics and communication and is acting as COO of Smarterify. All three have worked before at Tata Elxsi as senior engineers before cofounding Smarterify. Smarterify offers one of a kind combo of modular touch switch and home automation technology, which is our USP and is very difficult to find in market, our smart switch is Wi-Fi enabled and retrofittable. The modular touch switch with capacitive touch, adds an epitome touch of luxury to your home. There is no need for installing any separate device or hub etc., all the customer needs to do is replace the existing modular switch and install the Smarterify smart switch and start controlling the home appliances. 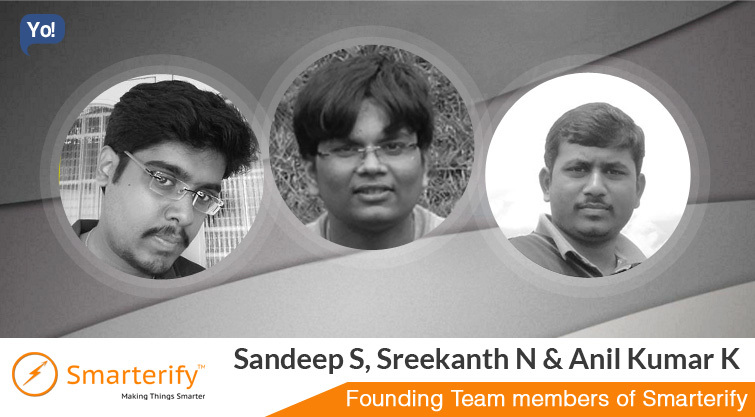 Three people Sandeep S, Sreekanth N and Anil Kumar K. founded Smarterify after extensive brainstorming and ideation phase. We had previous stint in Tata Elxsi as senior engineers. As colleagues and likeminded people, we had a long burning desire to get out of 9 to 5 zone and make a dent in the universe, which led us to leave our jobs and establish Smarterify (Pradyuth Technologies Pvt. Ltd. Incorporated on 18 September 2015) with an aim to become one of the leading players globally in IoT arena. Chase your dreams no matter how big it is, work hard and success will follow, because you live only once. In startup ecosystem, every day is challenging and new, the most challenging part is making people realize that smart home is now as affordable as the smartphone, since smart home or home automation is still in the nascent stage in India. Our team is conquering all small and big barriers, which is coming our way to give best in class high-quality products to consumers. We are reaching out to consumers through all possible channels and throwing light on the features and advantages associated with this amazing technology of IoT, and collecting their feedback to improve our products in all possible ways. Smarterify is currently bootstrapped, and is actively looking to raise funds and expand its foothold in all major cities of India, by the end of 2017. We are currently a team of three people and each of us is working together with an aim to be one of the top IoT players, we are planning to hire shortly. Goanimate and Canva are great tools for digital marketing i.e., Goanimate can be used for creating explainer videos and Canva for creating any banners or posters for ads. Thinking and planning the activities, which may be a year ahead, will always give us enough time to redefine or refine our ideas. We have not gone for an outing from past one year because of the workload; we have realized that short breaks are needed in between to be more productive. This is the habit we want to change! Having patience and understanding the fact that everything takes its own time. Mistake of not chasing their dreams. Do not stop at any point, perseverance leads to success. Smarterify is currently bootstrapped, and is actively looking to raise funds and expand its foothold in all major cities of India, by the end of 2017. Currently operating in online B2C model, Smarterify is opening its wings to offline market and soon planning to start operations in B2B model. We are planning to bring in different product variants with different colors into the market very soon. I always think mistakes makes people learn and I am satisfied with my journey. Ooty, Coorg and any place in WesternGhats. Your time is limited, so do not waste it living someone else’s life. Do not be trapped by dogma – which is living with the results of other people’s thinking. Do not let the noise of other’s opinions drown out your own inner voice. In addition, most important, have the courage to follow your heart and intuition. They somehow already know what you truly want to become. Everything else is secondary. – Steve Jobs.